Global Music Award-winning heavy metal group ENEMY REMAINS are thrilled to share their entire new album, No Faith In Humanity, with fans on this day of critical historical relevance. ENEMY REMAINS have crafted an album inspired by the need to wake up, unite and regain faith in ourselves and others during this tumultuous time in our country’s history. The band cites No Faith In Humanity, which hits stores today, as their personal contribution to social awareness. In a band statement that weaves the concept of each track together, ENEMY REMAINS says,“In a time when evil is on the cusp of rule, and darkness brews the sky a dark brimstone ash… it is in this hour that men and women, our “Colony” as a whole, find their true worth. Where we lay down our petty differences and join together in unity to fight a common enemy. Tyranny and persecution may be responsible for the coming together of man, but a longing for togetherness still leaves us all feeling “Empty Inside”. When the ability to “Trust In No One” has become so great and we are simply “Divided by Hate”, we know that tomorrow is not promised and we should feel grateful that we even get to “Breathe Again”. Having “No Faith In Humanity” forces us to stomp our feet down and say NO! We will not allow this to happen! That there are two kinds of people in this world: those that watch things happen and those that make them happen. A wise man once said that ‘we are the music makers, and we are the dreamers of dreams’! Not putting our foot down in some way, shape or form would be a universal crime in itself, would it not? Leading up to its release, No Faith In Humanity charted as the #1 most added metal album at radio in the country at Metal Contraband, and #2 at metal radio in CMJ Loud Rock. These are considered the two leading radio trade publications. No Faith In Humanity, is available to order now via iTunes. The album features pre-production by Jeffrey Weed (Trivium, Korn) and Maor Appelbaum (Faith No More, Sepultura, Halford). The album was recorded, engineered and mixed by Nick Bellmore (Toxic Holocaust, Jasta, Kingdom of Sorrow) at Dexters Lab Recording, and mastered by Chris Zeuss Harris (Rob Zombie, Queensrÿche, Hatebreed). Don’t miss this! 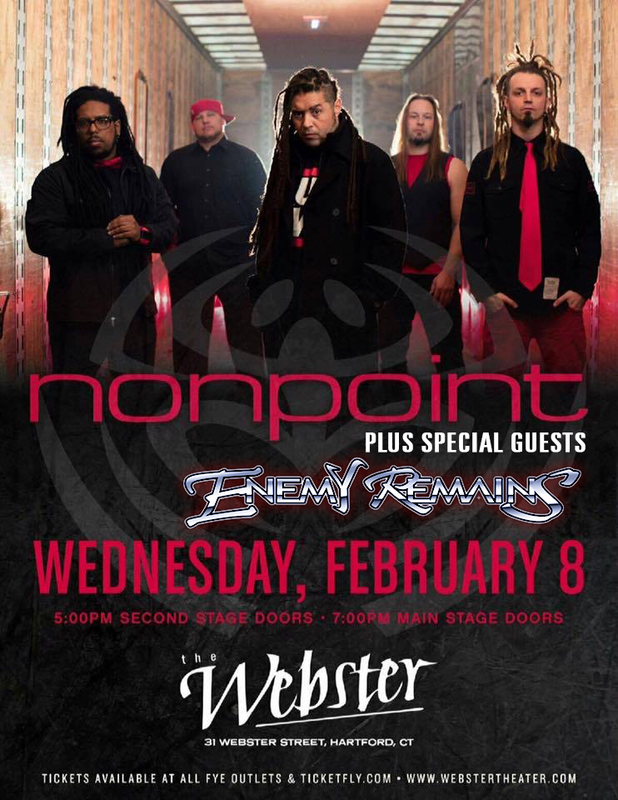 ENEMY REMAINS will perform with Nonpoint on February 8 at The Webster in Hartford, CT. The second stage opens at 5:00pm and the main stage opens at 7:00pm. Visit www.webstertheater.comfor more information. 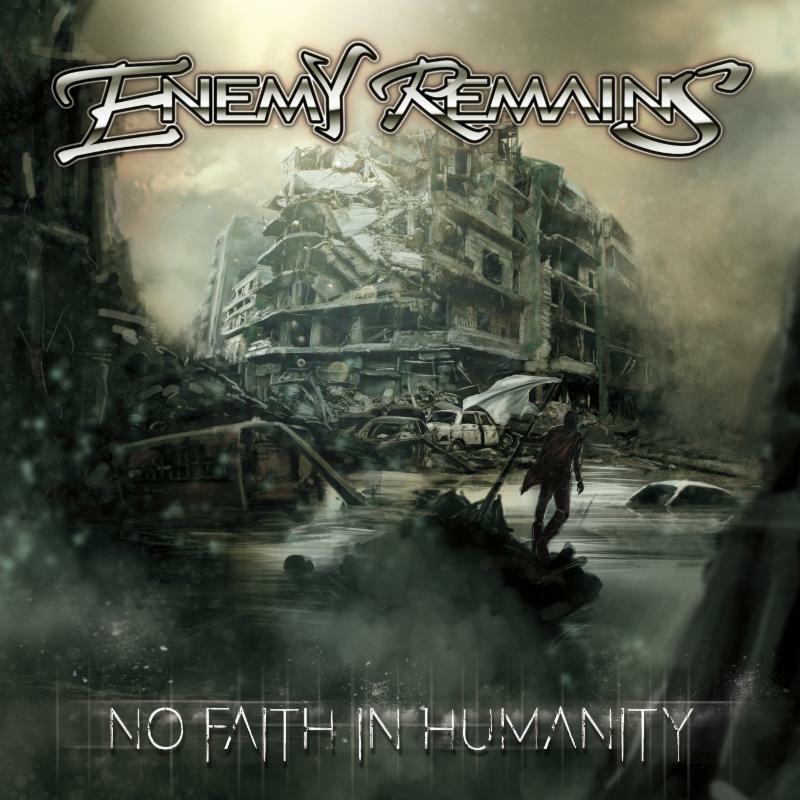 ENEMY REMAINS was formed in 2005 by original Fates Warning drummer, Steve Zimmerman, and guitarist Tommy Blardo. After releasing their first full-length album, Two Faces Two Minds, sharing the stage with rock luminaries such as Alice Cooper, Queensrÿche and Heaven & Hell, being the first local artist invited to perform at Hartford, CT’s new 20,000 capacity stadium, XL Center, and having their song “Live For Today” featured in the Rock Band for Xbox, by 2014, the band had solidified themselves as a talent to be reckoned with in the northeastern US. After a brief hiatus last year – allowing Zimmerman to re-join the original Fates Warning line-up reunion celebrating the 30th Anniversary of Awaken The Guardian, and for Blardo to develop his nationally-recognized digital radio station “Metal Fortress Radio” – ENEMY REMAINS is back with the addition of new vocalist Frank Morin and guitarist Scott Kadish, formerly of End Time Illusion.